Rose in Thorns: My couch and it's many outfits – Part 2: The Finale! My couch and it's many outfits – Part 2: The Finale! Along with riding around around on my bike in a pink dress over the weekend, I also finished the (seemingly) mammoth task of finishing the new covers for my couch. If you missed the first post, with before pictures, you can read it here. It is a great feeling to finally finish a project that has been going for a long time, over six years I think! Here are the pictures. The light wasn't great for taking photos, so I apologise for the quality. 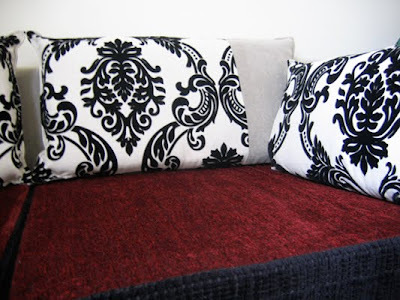 All the cushions are double sided, which means I can change the look of the couch whenever the mood strikes. 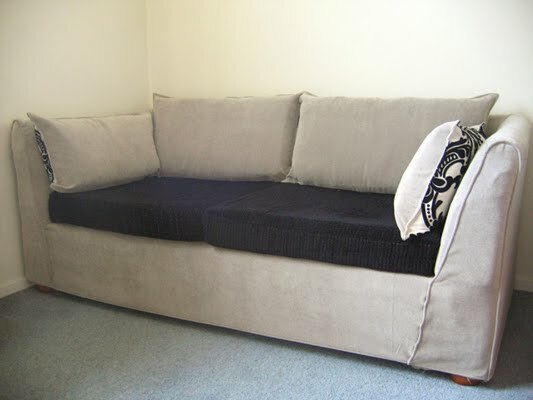 Since the last recover, I replaced the calico on the base of the couch, put on some new feet, replaced the foam chip seat cushions with foam squabs, and replaced the wadding on the back cushions with some recycled wool batting. As well as sewing new covers for the whole thing! So, what else needs finishing...? Very nice job. 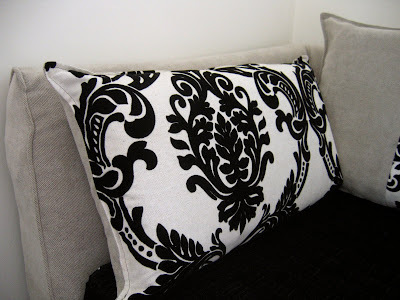 The damask pattern is very similar to the pattern I have on my website. I love it. 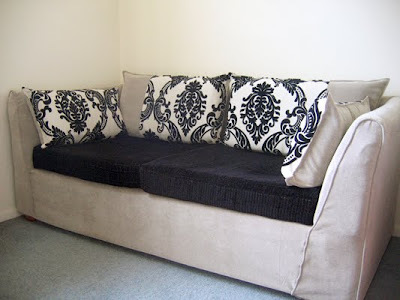 A great idea to have double sided cushions too. An amazing transformation! I'm very impressed. Amazing job Rose, what a journey the couch has been on! very impressive! Hurrah finished! Its a really nice shape, so I hope your partner has changed his feelings about it? I would like to join the line for sofa recovering, maybe you can run a workshop? I'm in no hurry as Miss 2 loves to draw on everything, including the sofa...maybe we'll wait until she goes off to school. Looks awesome Rose! Sounds like it was a lot of hard work, but well worth it. Wow Rose, that looks amazing. My limit on those sort of things is cushion covers . . . covering a whole sofa is beyond me!